Friendly's Ice Cream, the 80-year-old casual family restaurant chain, is out with a new television campaign inviting families and consumers of all ages to "Come Get Happy." Boston-based agency Forge Worldwide, in its first work for Friendly's, has created six new 30-second spots. Each fictional vignette portrays a fun visit to Friendly’s, and conveys a “Welcome Back to Friendly’s” message and an offer (like Friendly’s new “Fiver"—a standing $5 offer whose components will change over time). All spots end with the “Come Get Happy” message. 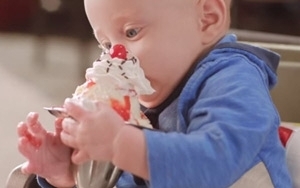 The first two TV ads, which have already begun airing, feature three senior men having a ball acting like kids (blowing straw wrappers at one another, for instance), and a baby literally throwing himself or into his/her first ice cream sundae. The new TV spots will appear on network and cable outlets throughout the Northeast and Mid-Atlantic regions. Two more will debut in April, and the last two this summer. The campaign will also include social media, print, radio and out-of home. “This campaign is an important culmination of the many changes and improvements we have made to the brand to increase our relevance and preference for our broad range of guests,” said Randy Davis, who became CMO of Friendly’s last September. Davis's background includes having served as senior director of U.S. brand strategy and innovation for McDonald's Corp., and VP of brand strategy and innovation for Applebee's International. Wilbraham, Mass.-based Friendly's emerged from bankruptcy in January 2012 after its owners, Sun Capital Partners LLC, repurchased the company for nearly $123 million. The deal eliminated some $297 million in debt. Sun Capital also closed more than 100 restaurants. Since John M. Maguire became CEO in summer 2012, Friendly's, which had become run-down and diluted its brand during its years of financial struggles, has reemphasized its signature classic American sandwiches, burgers and ice cream desserts, but also added a roster of new items, including lighter fare like salads and wraps, and new kid-friendly items, reported Nation's Restaurant News. It's also invested in many operational upgrades, including restaurant remodels. The chain, which has more than 250 locations (most franchisee-owned) saw its revenue drop 30%, to $407 million, between 2011 and 2013, according to Nation's Restaurant News. But it now reports revenue of more than $500 million, including system-wide restaurant sales of $384 million, plus retail sales of its branded ice cream products, sold in more than 8,000 stores.